The Indigenous People of Biafra (IPOB) has demanded that the Federal Government should produce its leader, Nnamdi Kanu, and unconditionally release four others standing trial at the Federal High Court, Abuja, over alleged lack of evidence and incessant adjournment of the case. The group said either the federal government produces Kanu and release four others standing trial, namely Benjamin Madubugwu, David Nwawusi, Bright Chimezie Ishinwa, Chidiebere Onwudiwe, or it will intensify campaign of civil disobedience on the streets of Biafraland and beyond. IPOB Media and Publicity Secretary, Emma Powerful, alleged plans to adjourn today’s sitting. He said: “Either they release our brothers tomorrow unconditionally or we, Biafrans, will intensify our campaign of civil disobedience on the streets of Biafraland and beyond. “We have truly endured this injustice for far too long and enough is enough. “We shall not allow this to continue unchallenged. The incessant adjournment of this court case must be put to a stop today. Self determination is enshrined in the United Nations Charter of rights of indigenous people and African Charter on Human and Peoples Rights which was ratified by Nigerian government and domesticated into the laws of Nigeria. “Therefore, it is within the legitimate right of IPOB to agitate for self determination, using the same law as provided by the United Nations and the African Union, which Nigeria is a signatory to. 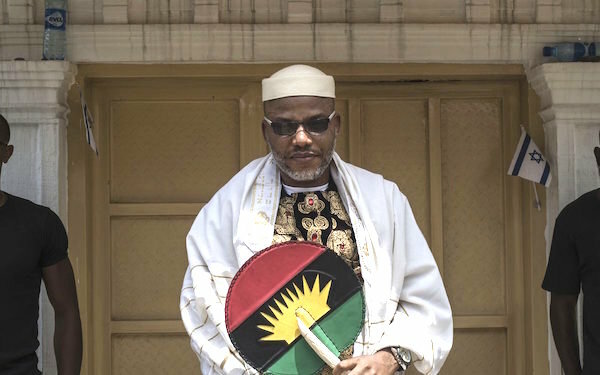 “We, hereby, place the judiciary of Nigeria and the world at large on notice that less than 24 hours to the commencement of trial of those charged with Mazi Nnamdi Kanu, they are still to be served an amended charge as ordered by the presiding judge, Justice Binta Nyako, at the last hearing over four weeks ago.